A true classic ripped from the pages of the comics on which the show is based. This outfit “Officer Friendly” found in his old sheriff station in King County has become synonymous with the eerie atmosphere and grit of The Walking Dead’s first season. It’s a nostalgic and iconic look, not to mention a rare clean one! A mainstay in Walking Dead merchandising and on the show, Daryl’s leather vest is as essential to his character as the layer of dirt in which he’s been covered since Season 3 (take a shower, Daryl!). Though it’s been worn down and stolen a few times over the years, Daryl’s vest always finds its way back to him — just as he always seems to find his way onto a motorcycle. First appearing at the end of Season 3 and then suddenly vanishing, Madison’s leather jacket survived the dam’s fall and apparently… floated its way back to her in the wreckage? We can forgive that tiny slip-up in continuity, because this look is just so badass. There are echoes of Negan to be found in that black leather, which makes sense given that then-showrunner Dave Erickson’s original vision for the character was a downward spiral into Governor/Negan villany. When Rick wears this coat… stuff and thangs are about to go down. Nicknamed “the murder coat” by the show’s fandom, there’s a reason the moniker has sunk in and stuck like the numerous bloodstains this jacket has worn over the years. Rick has taken down some of his most fearsome foes, like the Claimers and the Terminus baddies, while wearing it. An underappreciated gem, Michonne wore her sheriff outfit for a few episodes when she and Rick were appointed “constables” during their first days in Alexandria. Her getup featured a few additional creative touches that her companion’s lacked, including stylish yellow laces running up the back and a slim, sleek cut. She may not have kept her constable gear for long, but it was long enough to inspire a Funko POP! figure in full uniform. Putting a new spin on the regular ol’ plaid shirt -— which is seemingly a staple for survival in the zombie apocalypse — Alicia’s purple plaid added a pop of color to Fear The Walking Dead’s third season. The vibrant violet is a stark contrast to the more muted blacks and greens she wears in the show’s current season, and this shirt saw her transform from a budding badass to a hardened survivor. It’s hard to choose just one outfit from Carol’s Stepford Wives phase for this list, so we’re including them all! Carol’s plan to put on the mask of a meek housewife in order to spy on the people of Alexandria involved a whole grove of overly-flowery sweaters, meticulously-ironed chino pants, button-down shirts in almost every pattern imaginable, and *shudder* another sweater patterned with sparkly silver ribbon. Her new look, while necessary for the group’s survival, earned her a “You look ridiculous!” from Daryl. We have to agree. Never before has an outfit in The Walking Dead franchise so fully embraced a character’s personality, quirks, and uniqueness. 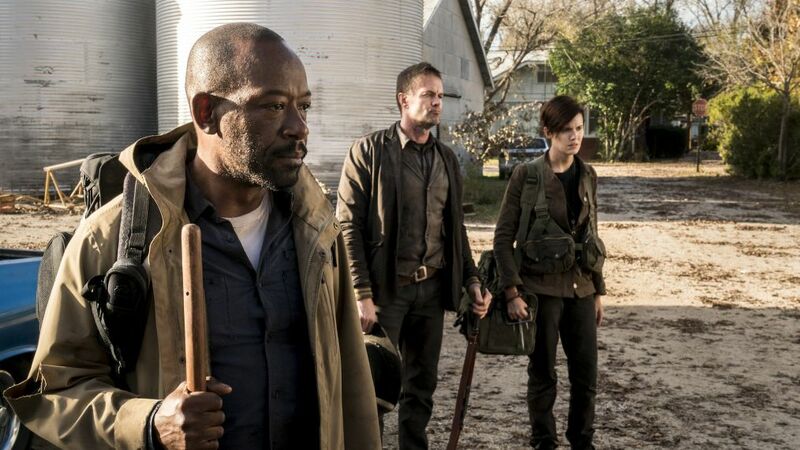 Nick’s getup in Fear The Walking Dead’s first season radiates his temperament; it’s a little frenzied, a little unconventional, a little fraying around the edges and falling apart. It has the look of being hastily thrown together rather than planned, which works for a drug addict questioning his sanity at the outset of the zombie apocalypse. This look doesn’t just say “Season 1” — it screams it. Featuring a logoless baseball jersey and his classic red baseball cap, Glenn certainly looks the part of a pizza delivery boy turned apocalypse survivor. It all exudes a heartwarming innocence he managed to keep throughout the series, even when he traded the jersey and cap for riot gear at the prison. Could this be Maggie’s version of the famed “murder coat”? Probably not, but they could be siblings — there are notable similarities, right down to the contrasting collar. The plaid inner lining really makes the colors stand out, and her trusty cross-stitched belt holds her knife and gun just as well as it did back in Season 4. It’s never a good idea to mess with Maggie Rhee, but this coat adds another layer of intimidation and skill. If you’re not Negan, you might be after seeing this outfit and the scene in which it was introduced. Negan’s first minutes on the show struck the perfect balance of chilling and sinister and flat-out terrifying, the notorious “who died?” cliffhanger excepted. His pristine black leather jacket and red scarf, accessorized with his beloved barbed wire bat Lucille, reinforced the idea that there was, indeed, a new world order — and that Rick Grimes and his friends worked for him now. On a show about the high cost of survival when the dead roam the Earth, fashion isn’t a high priority. But let’s face it: Everyone on The Walking Dead looks good (well, except for the walkers). Functionality is key, but that doesn’t mean our heroes don’t slay when they’re slaying! 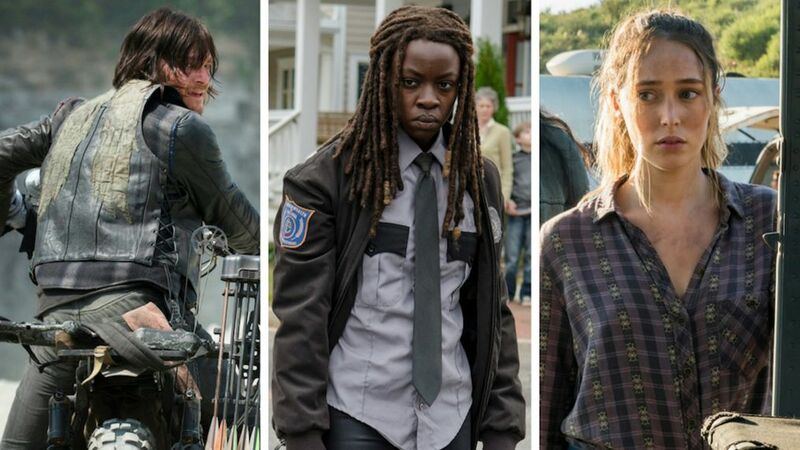 Click through the gallery above to see our favorite Walking Dead and Fear the Walking Dead fashions from seasons past.